Happy Friday my friends! I have an awesome tool that I want to share with you that I am so excited about. Before I explain this product, a little bit of what is going with me. As some of you may know, we moved to Montana last year and are taking care of my parents house while they are on a mission for the Church of Jesus Christ of Latter-day Saints. We are so grateful to be doing it, but with two little girls I am a bit paranoid about keeping it in tip top condition for when they get back. One of the biggest problems we have had is dings in the wall – from toys, laundry baskets, rocking chairs, etc. I have been looking for a quick solution for touch ups that I can do quickly and easily without a lot of hassle. 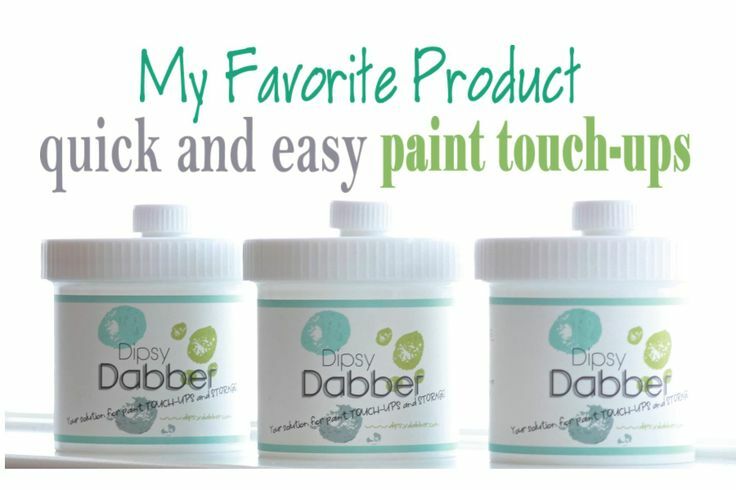 As I was browsing the internet for a good solution, I came across Dipsy Dabber, which was exactly what I was looking for. Have you ever heard of it? I contacted the company and they were so nice to send me a few to show to you. To put it simply, it’s a storage container for paint that comes with the brush attached. You don’t’ have to worry about storing huge cans, which I love, and when you do see a spot that needs a little touching up, everything is right there. I love the label that is on the container where you can write everything down that you need to know. No more guessing or testing when trying to cover up those little dings in your wall. As soon as I got it I wanted to try it out. …and VOILA!! As good as new. Seriously one of the easiest thing I’ve ever done. I was able to touch up all of the spots I wanted to within 10 minutes. Another great thing about Dipsy Dabbers, you can stack the containers. LOVE!!! Has anyone else tried Dipsy Dabber? I haven’t been given any compensation to write this post, just a few containers to try out from the company, and am passing along a product that I think is great. If you are interested in ordering some, you can go to the site here or order them off of Amazon . Also, I am finally jumping ship from blogger and switching over to Word Press with some new and exciting things coming to the blog. The migration is happening this weekend so I apologize for any technical difficulties, but am so excited to show you the new and improved Favorite Paint Colors. Have a great weekend everyone! !